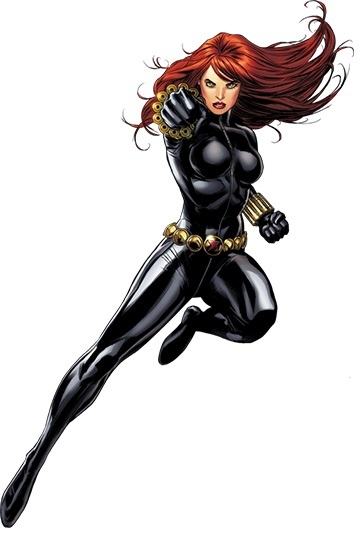 The Black Widow is a world class athlete and gymnast, expert martial artist (including karate, judo, aikido, savate, various styles of kung fu, and boxing), markswoman, and weapons specialist as well as having extensive espionage training. She is also an accomplished ballerina. The Black Widow uses a variety of equipment invented by Soviet scientists and technicians, with later improvements by S.H.I.E.L.D. scientists and technicians. She usually wears distinctively shaped bracelets which fire "widow sting" energy blasts, as well as "widow line" grappling hooks, and tear gas pellets. She wears a belt of metallic disc-charges containing plastic explosives. Her costume consists of synthetic stretch fabric equipped with micro-suction cups on fingers and feet, enabling her to adhere to walls and ceilings. Black Widow would also seem to have enhanced physical abilities above the human norm, although the exact extent of these enhancements is unknown. Among these enchanments would seem to be a reduced aging process, as it has been shown that she was alive as a child in World War 2, but looks to be no older than her late 20's or early 30's.